My dad peels the perfect potato...and he does it the right way...there is no other way! At least that's what I heard about a thousand times growing up. As mentioned in a previous post, my grandmother owned a restaurant, or a diner of sorts, in Moab, Utah. My dad grew up peeling potatoes. In his words, "thousands of potatoes!" He would leave school during his lunch break to peel potatoes. Every day after school, he would peel potatoes. So, we never argue with my dad, when it comes to peeling potatoes. He knows the perfect, most efficient way. Before I say anything else though, I have to give credit to my husband for this cooking tip. He was the one that thought of it when we first got married. One day I was making mashed potatoes for a family party. As I was peeling a lot of potatoes, a light bulb came on. For our wedding we had received on of these little contraptions. 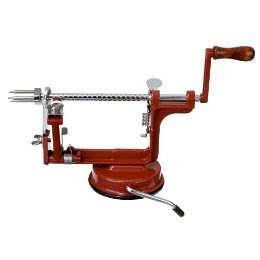 It's an apple peeler. I was excited about it because I love to make apple pie and I also love to dehydrate apples. This machine cores, peels and slices the apples with great efficiency. But it also peels potatoes. 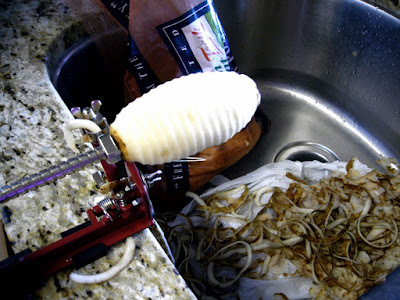 If you remove the corer, it will peel a whole bag of potatoes in about a quarter of the time it takes to hand peel. It's also less messy, and it leaves you will these really cool long potato skin strings. I couldn't resist figuring out something to do with these fun strings. I knew they would be really good fried, but that would be a little more fattening than I wanted. So I decided to try and bake them. 2. Place the potato skins in a large zip lock bag. 5. Bake for 15-20 minutes or until the skins are nice and crispy! A few months ago I was getting groceries and needed a couple of potatoes for a recipe. As I was looking at the prices I realized it would cost me $2.00 to buy 2 potatoes sepearately, or I could buy an entire 10lb. bag for $2.99. Well that's a no brainer. I try to be very frugel after all, especially in this economy. The probelm was I didn't need 10lbs of potatoes. I mean there's only 3 of us, and at that time Reese didn't eat solids. And I really don't need to be eating potatoes every day of the week. So I decided to buy the 10lbs, take the 2 I needed for that week and use the rest to make a huge batch of mashed potatoes. I dived the mashed potatoes into servings for my family and froze them in zip lock bags. Then when I need some for dinner or a recipe (I have some great bread recipes that call for mashed potatoes), I just pull a bag out of the freezer. I do this all the time now, especially when potatoes go on sale. A couple weeks ago I got a 15lb. bag of potatoes for $1.50 at Macey's. I made mashed potatoes and got 8 frozen bags for future meals. Now that's a great deal, and a huge time saver. Good tip! We like to freeze too!